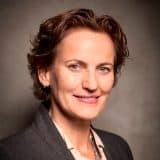 Francine Houben, founder of Mecanoo architecten has led the firm to success in The Netherlands and abroad, amassing a portfolio of work that is wide-ranging, inspired by global challenges and with a sustainable view on society. Mecanoo combines the disciplines of architecture, urban planning, interior design and landscape architecture to produce unorthodox design solutions born from a strong sensitivity to context and a highly interdisciplinary design process. Each of her projects illustrates the three fundamental elements of her architectural vision: People, Place, Purpose. She interweaves social, technical, playful and humane aspects together to form a unique solution to each assignment. Francine maintains an active presence in academia and culture, regularly publishing and giving lectures worldwide. She has performed in many academic and professional capacities throughout her career, including Chair of Architecture and Aesthetics of Mobility at Delft University of Technology, visiting professor at Harvard Graduate School of Design, and as director of the First International Architecture Biennale in Rotterdam. Francine has received honorary fellowships from the Royal Institute of British Architects, the American Institute of Architects and the Royal Architectural Institute of Canada. In 2014, Francine was named Woman Architect of the Year by the Architects’ Journal and in November 2015 Queen Máxima of The Netherlands presented Francine with the Prins Bernhard Cultuurfonds Prize for her wide-ranging career. Francine was awarded Honorary Doctorates from the Université de Mons, Belgium (2017) and the Utrecht University (2016).